Thanks to the video clips submitted by Tripawds members, we are happy to announce this new Tripawds Trailer! 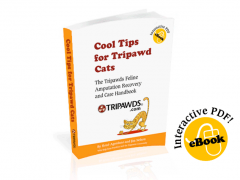 Three legged dogs and cats of the Tripawds community prove it’s better to hop on three legs than to limp on four. This video features Tripawd Heroes and Angels loving life on three legs: Moose, Sassy, Fang, Tri-Pug Maggie, Cemil, Jill, Domio, Frankie, and Stanley with cameo appearances by Wyatt, Shelby and Travis. Of the video clips submitted so far, we were only able to produce two new Tripawds Trailers. Stay tuned for Part Two and watch our featured playlists or visit the Tripawds Youtube Channel for more fun and informative videos. 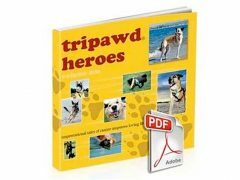 We’re still hoping to complete the Tripawds Trilogy, so read the clip submission guidelines and send in your videos—we may just feature your dogs and cats too! Now this is a smile making video!! It’s also a video of some of the world’s happiest tripawds living in the moment! Anyone facing the decision of amputation for their dogs or cats will find this invaluable. Thank you for putting this “documentary of happy trilawds” together. You’ve done an outstanding job of editing this in a way that would eliminate any doubts about whether a dog or cat can enjoy life as a tripawd. Sally and Alumni Happy Hannah and Merry Myrtle and Frankie too! !